When it comes to spread betting you have the flexibility to choose between an extremely short time scale for your trade and a longer more strategic timescale (although many market insiders would agree that spread betting isn’t as effective for much longer timescale investments). Day trading is about holding positions for a few hours, minutes or even seconds. However, this is not the only possible strategy. When trading, a speculator may have a longer-term perspective and may thus decide to hold a position for days, weeks or even months. If you are looking to trade over a longer time period, it is sensible to use futures which means that you won’t have to pay a financing fee every day your trade is rolled over. For instance, there are many traders out there who do’t dip in and out of the FTSE 100 some 20 or 30 times a day but instead utilise it like a stock broking account. They simply take a view on a stock on a short time horizon, like for instance a 3-month futures contract which they could close after a few weeks or couple of months if they wish to. So what are the timescales? Well firstly you have intra-day trading or same day trading, basically you’re looking at getting in and out of a trade position in the same trading day. There will no doubt have been a lot of this happening over the past few weeks with the huge market fluctuations and ground shaking breaking news and interest rate cuts for various central banks. In less chaotic times, major economic announcements made in the US give way to a frenzy of trading, especially on the US Dollar. Stretch things out a bit and you’ve got a short term trade, a trade made over the space of a couple of days, imagine a trader following the developments of a particular story around a specific share, or perhaps buying/selling oil in anticipation of an OPEC production announcement or buying/selling a major currency in anticipation of a major macro-economic announcement. Taking a longer view? We’re getting into medium trading territory then. This is where rolling bets that most spread betting providers offer come into play. A spread better does their research and has a view of a share/instrument increasing/decreasing in value over the space of a couple of weeks or a month and then backs this up. A sensible trader would also throw in a stop loss and perhaps a limit order to help mitigate risks and lock in potential profits. Want to push things out even longer? Then it’s long term trading. A more strategic and often more costly approach to spread betting (the futures spread bets have significantly wider spreads than the daily/rolling bets). An example of this might be a spread trader who notices that ever winter the price of heating oil increases, in anticipation of this he buys the future spread bet on heating oil at the end of summer. You can go even longer with a +6 months view to particular shares/indices as well, but because of the wider spreads, a lot of trading professionals would advise using CFDs instead of spread bets in this case. This is the most demanding of any type of trading and this trading style appeals to speculators looking to make a quick buck or use short-term moves to gain from any given situation. Day traders attempt to maximise their exposure to daily price volatility. 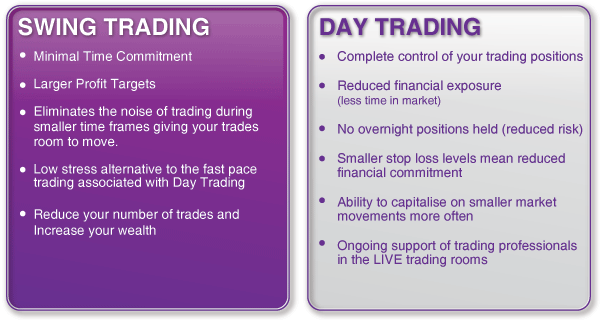 Day trading involves opening and closing of a trade before the end of the trading session on the same day that the trade is opened. It is necessary to be glued to your screen for most of the trading day. In the UK, this could mean getting up very early (before 6am) to trade the Dow, the S&P, the FTSE, gold, currencies, in fact, most electronic markets. Then to be available until 9pm when most markets close (in the UK). That is a 15-hour day, minimum. Currencies and commodities are particularly popular with shorter-term traders. Day spread bet traders typically open multiple positions during the day which can last between minutes and hours, looking to profit from small moves in the market. I know some traders actually do this and it is an interesting (albeit risky) way to trade since prices tend to move most in the opening and closing 30 to 60 minutes of a market’s trading day. These kind of traders usually trade on technical levels and financial market news. Some day traders tend to pick the time to place bet like choosing to trade on the day that economic announcements such as the Bank of England’s interest rates or the US unemployment figures are released. But if you’re really into day trading, you need to keep track of market movements constantly and know when to close your bet at exactly the right time. But, to preserve your sanity, I suggest you do not day-trade quite so intensively. Of course, with technology today, you can trade on the move with such devices as the iPhone, but you will always be on the alert for checking the market. I know there are systems that allow you to set your orders in the morning to get in and to get out, but I cannot recommend doing this. There is always the big market moves that require your attention. Bearing in mind a rising share price is exciting but it doesn’t make the money. It’s closing the trade that makes us poorer or wealthier. So, say you made big gains from RRL and let the profits slip away. Same with AYM and possibly a few others. Assuming RRL rockets back up, what is your strategy for taking profits? Has it changed? Knowing what you have learnt from day trading has it changed your opinion of when to take profits on end of day positions? It did it for me such that I now have a very similar strategy for both day trading and end of day trading. The other disadvantage is that in day-trading, you are looking for small moves and that is when the spread usually wipes out a large part of any gain you might make. Let’s say you are looking for a gain of $4 in Gold. Many firms have a spread on gold of $0.40, which is 10% of your potential gain. Of course, you may have a loser, and the $0.40 spread will add 10% to your loss. Naturally, as such for such short-term traders tight spreads will be of paramount important and prices should closely follow the underlying market. The only markets that make sense for day-trading are those with tight spreads, such as the Euro/Dollar (currently 1 pip), and the Dow (also currently 1 pip). A pip is a point (the smallest move in that market). One obvious advantage of scalping (dipping in and out of the marekts) and holding positions for only a few minutes is that you need a lower deposit than a swing trader who has to focus more on the risk to reward ratio. I think most are drawn to short term trading because it brings instant gratification. I think some are just naturals at it. They duck and weave and try to call things a system but actually they are, if you ask me, instinct traders! But even then, you need nerves of steel, a solid discipline in case the market moves against you, and lightening reactions and precision timing. If you have any doubts on this score, I advise against it, at least at first. Any advice on placing stops? I usually stop loss at 5-10% of margin, which is ok for day-trading but not very flexible for overnight holds. This is more like it! Short-term traders tend to deal in few positions through the week, normally lasting lasting from one day to a week. Swing trading often uses this time-frame to catch an anti-trend move of a few days. When trading against the main trend, it is usually a good idea to take a quick profit and run. Again, such traders rely on technical levels and financial market news looking to profit from small market movements. There is a difference between trading for an income and trading for capital growth, and the varieties employed for each outcome. For example, a day trader is far more likely to be trading for income, as opposed to an end of day trader, and more so, someone like me who trades a few times every month or quarter. This is where the majority of trades are made, especially when swing trading. Swing trading lies somewhere in between day trading and position trading. This trading method involves waiting anywhere between a few days and a few weeks to close trades. Such traders usually only take a few trading positions throughout the month, trading between 2 weeks to a month with the scope of making gains from market movements of between 5-10%. Usually when swing trading you do not move stops and let the position is closed when the move seems to be petering out (making use of technical indicators), or the spreadbet is stopped out. It comes with a degree of short term risk associated with day trading and greater opportunity for forward planning that you get with position trading. Most swing traders rely on technical levels although they sometimes also use fundamentals to back their views. Many uni-directional moves are over within 3 weeks or so. That is the nature of markets. But, using Elliott Wave analysis, if we believe we are in a 3rd Wave, these can go on and on and on. It’s like holding a tiger by the tail. We shall get to Elliott Waves in another section. Reader Question: What timeframe is the most profitable to trade? Answer: The choice of the time frame in technical analysis depends on the temperament of the trader/investor. A day trader looks at five minutes charts, whereas a fund manager would look at the weekly charts. But then it is always advised that a day trader reviews the daily chart to determine the current trend and then trade intraday, in the direction of the market. Reader Question: What data should we use? Answer: Let us take the example of gold. Gold is traded on various exchanges in the world, as various instruments, Spot, delivery, futures. These are the instruments based on Gold. The data should be relevant to the market, which you are trading. It is also important that the data should be from the market, which we trade. Example: A person trading the NSE (India) Nifty Futures should use only the futures data, and not use the underlying cash market Nifty data to trade. Similarly, when trading the S&P Eminis (USA), use the Emini data and not the underlying S&P 500 Index (USA). There will positively be changed from time to time between the two. The price levels could either be a premium or a discount between both. Further, while computing reversal and stop loss levels, the actual price is most important. The underlying security can be used to analyze the underlying trend, but the levels of each will be different, depending on their respective price levels. Reader Question: Have recently started spread trading and a few small lessons in what not do I got on a bet and made a good return on it going up. I got out and knew it was going down so shorted it but I kept getting very nervy when there was any sign of it rebounding and would bail out only for it to go down again. Just wondering how people manage a turnaround in the market. Do you go with the movement and stay in? Get out altogether? Or do anything else? Answer: It’s hard to comment without knowing what type of trading you are doing, ie technical, fundamental, news feeds etc. First mistake was saying you ‘knew’ the market was going down, nobody ever knows!! As regards staying in a trade or taking profits should depend on large time frame trends. If you are long in the market and the monthly, weekly, daily trend is up then stay in using pivot points to trail your position. If you are counter trend trading then you have to be more aggressive in taking profits. The trick is to know what the trend is in what time frame you are trading, this will give you both entry and exit targets. You should never be ‘nervy’ when you are in a trade, you have entries, targets and stops, it will either work out or it won’t! If you are not sure, as in your last trade, why not try this, when you are in the trade and you are in decent profit, take off half the position and put a stop at your entry price or just inside it to cover commissions, that way you lock in profit and you are still in the trade for free! Continue to trail it with the stop until you are taken out, if it keeps going in your direction then you can start making decent money!! As regards trading both ways, that isn’t easy, remember, just because you would not buy a market does not necessarily mean you should short it and vice versa! I would wish you luck but that doesn’t come into it either!!! Green Trades! Answer: I think that will give you conflicting results it’s very rare for that many timeframes to sync up, especially during these volatile times, I just look at the weekly at weekends and note down trending or ranging markets, and look for trades that tie into that trend during the coming week, a look each day at the daily just to see if any possible candle formations have set up, I only tend to look at the hourly for candle set ups around big news releases, believe it or not a lot of planning goes into my trading madness! Reader Question: Is this system defined as ‘day trading’? Answer: No. Day trading generally involves opening and closing several trades, several times a day, and being all square by the close. Swing trading is a short-term trading approach, whereby your position lasts for a few days, typically 7-10 days. This does not demand anywhere near the focus required of day trading. Furthermore, day traders are often glued to their screens watching prices move and capitalizing on small tick movements in prices. Swing trading allows you to spend no more than 15 to 30 minutes a day in front of a computer screen [unless of course, you chose to spend more time] each day. It is very nice to catch such a move. Usually, these are quite rare, unless trading with a major trend. This trading style is sometimes referred to as position trading. Traders here try to take a market perspective over a longer period of time, possibly over several weeks or months with such traders taking only a few positions during a quarter. These kind of traders tend to aim to make gains of moves in the market of 10% or more. A subset of position trading is momentum trading where one takes a trade on a stock that is consistently moving in one direction. Momentum traders rarely looking at valuation and this trading strategy can be risky, but momentum trading can also deliver big returns since momentum can last a lot longer than one might expect. Such trading styles are suitable for traders and investors who are looking to capitalise on bigger movements, and as such they will often make less bets than a day trader. The key to success here to is understand the fundamentals or price trends of the market; namely by utilising news, economic data or technical analysis to predict a market’s direction. Position traders typically disregard short-term fluctuations in prices. Should your bet go the wrong way, it’s obviously still vital that you have a closing order such as a stop loss to try and mitigate any losses you make. Position traders base their trading on both technical levels and fundamental analysis across Monthly Future spreadbets and Quarterly Future spreadbets. Once in a while, a situation comes along which begs to be held for months if not years on end. Because I do not believe in riding out large adverse moves, these situations are rare. You have to be extremely sanguine trader to ride out a 50%+ move against you, especially when you have built up a significant profit. Besides there’s a financing cost in open spread betting positions and although this may amount to less than 2% for holding positions up to 4 months, after this the cost of keeping positions open begins to make itself felt. Let’s say your position has a profit of £10,000 on an £8,000 account. Would you be happy seeing that profit dwindle to £5,000, or £4,000? Most traders wouldn’t, so we would take profits somewhere between £8,000 and £10,000, and then re-evaluate from a neutral position. More on this later when we discuss strategy. Long term traders base their trading on a mix of technical levels and fundamental analysis across Monthly Future spreadbets and Quarterly Future spreadbets. Of course if you are by nature more inclined to buy and hold then it is not probably smart to try predicting trends in the markets. You’d want to put your capital in blue chip stocks and collect the dividends while seeing the stock price rise in time. As such you shouldn’t be concerned with day-to-day market fluctuations. Some of these traders could be growth investors looking into buying shares in generally small companies whose sales and earnings are expected to grow considerably in future – the basic premise being that as earnings grow, the company’s stock price would be re-rated with the stock price following. Other traders may be ‘value’ investors looking to buy and hold shares that look to be trading at a discount or left on the side by the market. Or they could be contrarians – traders looking to go against the flow and prevalent trends; a tactic that requires discipline and a good appetite for risk! To analyse such companies value investors could analyse the company’s fundamentals and check the main valuation metrics like price/earnings (PE), price-to-book value, and dividend yield. Of course such stocks could take plenty of time to net a gain but if you do your homework right, the rewards could be great. For those interested in long term trading, there are a fascinating series of books by Nassim Taleb…’fooled by Randomness’…etc which are well worth a read…if you haven’t already. Inside, the author explains just how most are too focused on short term rather ‘insignificant’ events…whilst lurking in the background are the ‘life-changing’ events. He suggests that people should in fact be more concerned with the generalities and abstract (not what humans are good at)…instead of the normal and regular. In this respect…a 13% rise in several months would be rather mundane…compared to a prospect of a 50% fall in one day…which can’t really be anticipated by the crowd! If you’re not taking multi time frame signals you shouldn’t be showing or even considering what the end of day chart is doing. If you’re trading the micro Dow on economic news then you need to have economic signals both bull and bear. If you’re into discretionary trading on gut feeling without a clear strategy then that’s fine but don’t cherry pick charts or curve fit m/a’s or only pick bad news to justify your gut feeling. Just admit it’s a gut feeling that I only want to trade Dow 1hr short. I don’t have a problem if it’s the latter. Remember also that a lot of spread betters use all these timescales in parallel, while others will have a favourite style. There are definite advantages to diversifying strategies, whether psychological (distracting yourself, avoiding temptation to alter long term holdings, avoiding inevitable discouragement from having a bad month or even year on one/two of the strategies), or financial benefits (diversification is good anyway, you’ll benefit in the long run from the frozen-in-time method, the swing trading and the day trading account week-to-week). You just need the time, dedication to learning different strategies, and the acknowledgment that you’ll spend years getting good at all three. You can take comfort knowing your long term stuff will work out in the end, but you also are active in trying to produce year-on-year profits in an actively traded portfolio, to lessen the psychological and financial pressure on yourself. This is far less likely to have a bad month or year than a rigid buy-and-hold for dividends and value approach, which may take years to pay off! Again, it reduces the pressure on yourself on strategies that can have a bad month or two, or even a bad year. Note: If you want to day trade or scalp for real, it may be better to trade DMA. If you want to swing trade, spread betting is okay. Spread bet brokers are fine for long term trading where you may be in a trade for days. I wouldn’t go as far as to say you can’t day trade with spread trading companies, but you certainly place yourself at a disadvantage. Intraday is hard enough as it is without additional obstacles. In my experience you can definitely day trade with spreadbets, but only with small stakes and modest targets. Longer term with spread trading is probably much more doable.